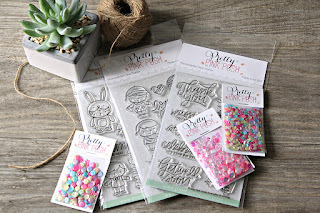 I was super excited that the CardMaker Magazine blog and Pretty Pink Posh teamed up for a blog hop because I have been a huge fan of Pretty Pink Posh for a LONG time. 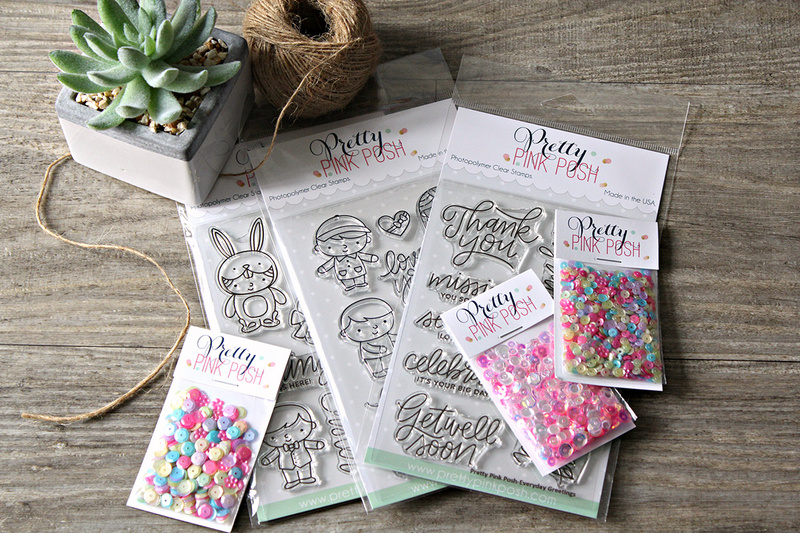 I loved their sequins and and goodies for shaker cards and now that they are creating dies and stamps too I couldn't love them more! Be sure to check out the Pretty Pink Posh blog at the end of this hop because they are hosting a fabulous GIVEAWAY! I made two different cards with my Pretty Pink Posh goodies. 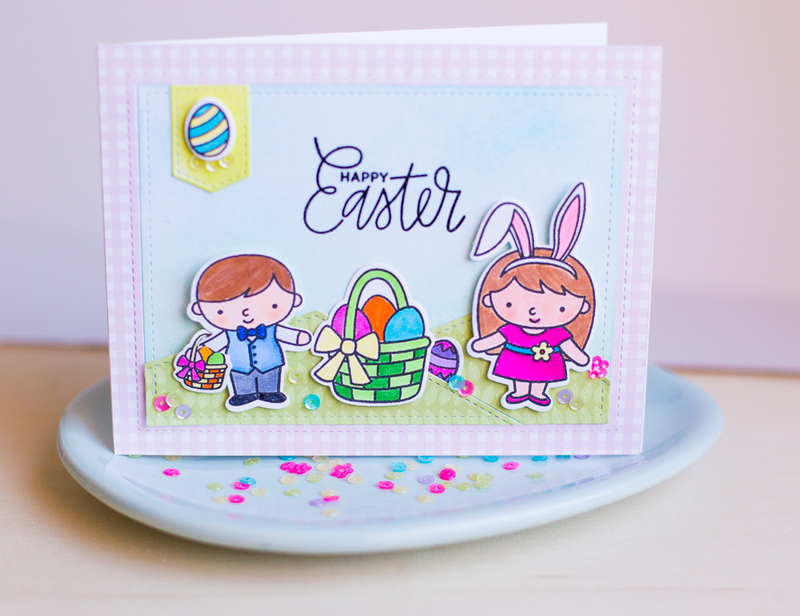 First I created this Easter card with the Easter Friends Stamp and Die set and the Stitched Notes Die Set. I used the pocket dies to create little hills and sprinkled some of the Fresh Garden Sequin Mix to mimic easter eggs. For my second card, I used several layers of foam to create an egg shaped shaker element on my card. I used the same stamp and die sets but I added some Clear Droplets to the shaker as well. I created a video that walks you through step-by-step in creating this egg shaped shaker! Your next stop on the hop is the amazing Heather Pulvirenti with incredible inspiration to share. Be sure to stop by and comment on all the blogs on the hop and end at the Pretty Pink Posh blog for your chance at that amazing giveaway! If you get lost along the way, all the blog stops will be listed on the CardMaker Magazine blog. Sweet cards, Rebecca! Love the egg shaker! Love the shakers and your clever idea to use the border dies as hills! Cute, cute cards. I love shaker cards and who wouldn't love getting yours in the mail? Adorable cards! I really love the shaker card! What adorable cards. 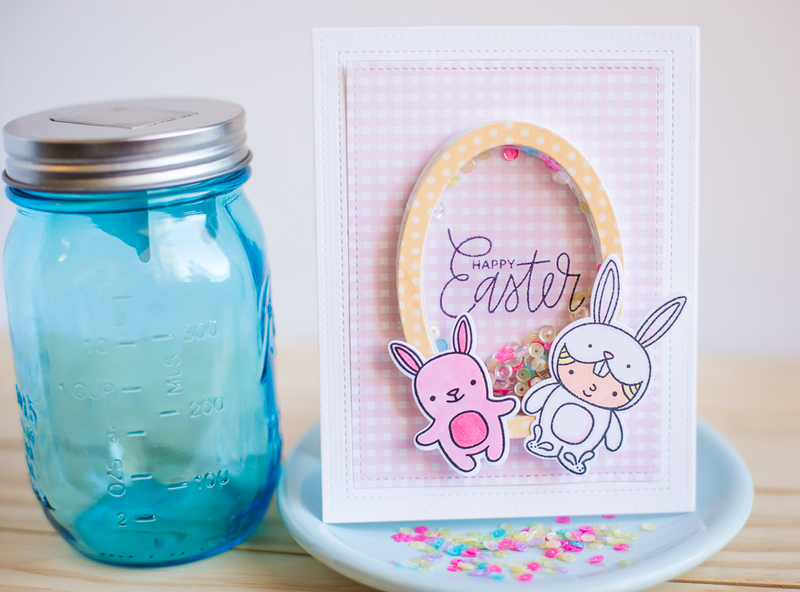 I love the bright colors on your first card and the shaker egg window on the second card. Lovely spring colours! Cute little figures as well. I love the super cute images!! Fun stamp & die set! Adorable cards!! I love the pretty sequins too! Love the cards, especially the shaker one!! 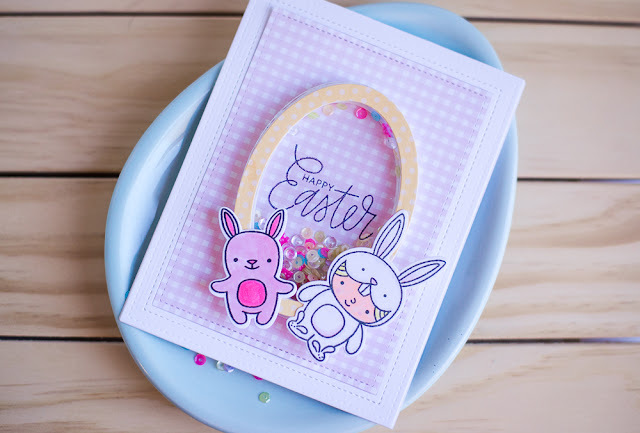 Sweet, sweet Easter cards! I adore that Shaker! Cute cards. I really like the first one. The sequins make such pretty "stuffing"
for the shaker. The colors are great. Two really cute cards! Thanks for the video, as well! Really adorable shaker. PPP has great things for shakers. Happy Easter and thanks for sharing. Rebecca, these are so stinkin' adorable!! The kids dressed up reminds of years gone by that are such cherished memories!! Thank you for sharing your two adorable cards!! Am loving them! OMG, this is absolutely adorable. Two ADORABLE cards, full of creativity! Lovely cards. Really adore the shaker card - it is so CUTE!!!! I love the vibrancy of pretty colors on the first card and both are sweet, sweet designs. Very cute cards...love the bright colours on the first and the shaker on the last. Sweet Easter cards. I like your coloring and the egg shaped shaker. Both cards are super sweet!! Cute and adorable cards. Thanks for sharing your video on how you created the shaker card. I love your first card with the two cuties, but I adore your egg shaker card!! Cute cards! Love the shaker card! Your Easter cards are fantastic! The little boy and girl remind me of my niece and nephew, so that's one I most certainly adore! Your egg shaker is incredibly sweet! A duo of delights! Cute cards! I love the colors you used on both of them. The egg-shaped shaker is so fun! Love your cards. The egg shaker is cute, cute. Simply adorable cards! Love the colorful shaker. Great cards! That shaker card is awesome! Adorable little Easter scene!! And that shaker card is so cute...the egg is a perfect shape for that!! These cards are sweet and fun. Great video, too! Great designs. Very soft and sweet. Love it. Oh so colorful and adorable!!! These are so cute! Love them with their little bunny ears! I love the shaker card...so cute! Love the Easter scene and egg shaker card, so fun and festive! Sweet cards Rebecca, especially the shaker! I really enjoyed watching you make the shaker card.